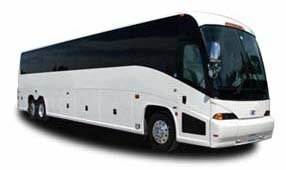 With a capacity of 56 passengers, this full-sized charter bus is perfect for large traveling groups anywhere in Texas, including major cities like Houston. You’ll stay comfortable on short-distance or long-distance trips with reclining seats, restrooms, WiFi, televisions with DVD players, and more comfortable amenities. You’ll also be able to store all of your luggage and carry-on items with room to spare, with lots of space offered in overhead bins and spacious luggage bays. Call Texas Charter Bus Company any time of day at 281-383-9491 to learn more about how we can help with corporate trips, sporting events, weddings, field trips, and more! With service in cities such as Austin, Houston, Dallas, San Antonio, College Station, and more across Texas, we're always able to get you exactly where you need to be. A 25-passenger minibus will give your medium-sized group a great travel experience from beginning to finish. These slightly bigger options are useful for college tours, intimate weddings, and so much more! Passengers can sit back and relax in a spacious interior while a professional driver handles the road. A 20-passenger minibus will give your group a little extra room for your trip around Texas. Equipped with additional seats and optional amenities like WiFi, power outlets, and televisions with DVD players, 20-passenger minibuses are sure to be a comfortable option for your travel group. Perfectly sized for small groups, the 18-passenger minibus is a popular choice for all types of events ranging from professional meetings to private social outings. This compact minibus is also great for groups requiring shuttle transportation to and from busy areas like airports and business centers. Being best suited for large groups, this full-sized charter bus offers the ultimate travel experience for every passenger. These larger models can include even more top-of-the-line features to keep everyone comfortable and entertained the entire trip. Equipped with plenty of storage space and seating options, the 56-passenger charter bus is a great option for sports teams or groups taking long-distance trips.